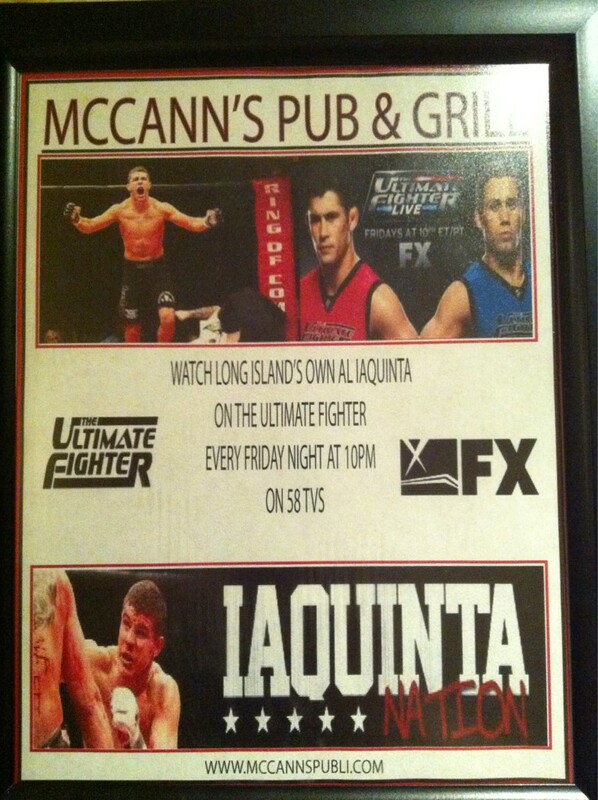 Once again I want to thank everyone for coming down to McCann’s this past Friday for Iaquinta vs. Ogle. As always it was a great turn out and everyone had an awesome time. I don’t mean to sound like a broken record but I really appreciate all the support for Al and I know his family does as well. Al saw a video of the crowd reaction after the Myles Jury fight, and spoke afterwards about how much everyone coming down to McCann’s, and the overwhelming support mean’s to him. If you missed it here’s a quick look into all the excitement inside McCann’s from Friday night. (Make sure to “like” McCann’s FACEBOOK page to see more pictures from Friday.) Check here later today for details on another viewing party and open bar at McCann’s this Friday March 25th. Also check out some video HERE from Newsday’s Mark La Monica. Mark has two post fight interview’s with Eric Hyer and Ray Longo, as well as video of the crowd’s reaction at the end of Iaquinta’s fight at McCann’s.